The winds here don't just pile snow up, they also carve it away, and they do so in a particularly strange manner. 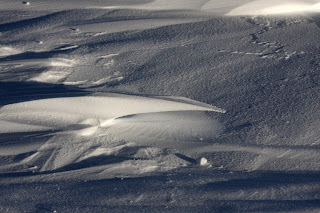 High winds tend to pile snow up into large drifts. Any obstacle (lump of snow, building or even a flag post) will rapidly develop a large complex drift downwind, complete with peaks and valleys caused by eddies in the wing passing over it. When the wind dies down, it also tends to lie closer to the ground, and instead of building drifts, begins to eat away at them, bottom first. This leaves the tops of some drifts poking off unsupported into space, their bases having been eroded away beneath them. These funny sideways spikes in the snow are known as sastrugi, and are absolutely amazing to see. So far, most are only a couple of inches high, but through the winter, they should grow up to a foot or so. Just large enough to catch your boot and trip you, and because of both the lack on contrast in the snow, and the lack of sunlight for the next six months, all you can really do about it is get used to the idea of falling on your face several times each time you go outside. While they only grow to a foot or so here, further inland, they can be 4-5 feet high, meaning 10 foot long spikes, which most people travel on top of, and risk breaking off or falling through. Sastrugi - another beautiful environmental factor that'll try to kill you in Antarctica.